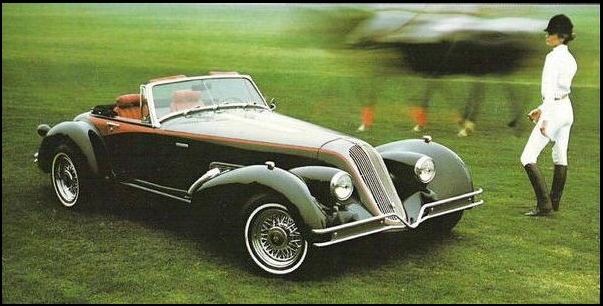 During the late 1970s, Alfred DiMora and Ray Kinney, two members of the Clenet team, joined Tom McBurnie to form Sceptre Motorcar Company to design and produce a unique luxury sports car. The Sceptre 6.6S was an art deco design with the flavor of the late 1930s classics. This hand-crafted, limited-production, specialty car was reminiscent of such vehicles as Delage, Delahaye, Bugatti, 1935 BMW, Alfa Romeo, 500 XK Mercedes, as well as the 1950s Jaguar. Perhaps the closest car of this style is the Talbot-Lago. Yet the Sceptre is not a replica of any one automobile. Appointments included hand-rubbed lacquer paint and an interior of Connelly leather and walnut burl that complemented the latest in drive train and suspension technology. The Sceptre won the Best-of-Show award at the Los Angeles Auto Show in 1978. Sceptre Motorcar Company produced 15 of these $39,000 automobiles ($50,000 for the turbocharged version) that emphasized sporty features compared to the luxury of the Clenet series of automobiles. Many of these automobiles were acquired by celebrities and dignitaries. The sixteenth was never completed from the factory but exists uncompleted to this day. The body of the Sceptre is made of fiberglass applied to a tubular steel frame. Only the doors are made of steel. The engine is a powerful 400-horsepower V8 connected to a three-speed automatic transmission. The Sceptre will go 0-60 in 7.2 seconds. The weight of the entire car is slightly over 3,000 pounds. The Sceptre is known for its high reliability factor. It is said that no other car has been built like the Sceptre with the exception of the Ferrari. Many articles were written on the Sceptre at its introduction, including: an article by Dennis Adler which appeared in the March 1979 edition of Car Collector, the 1980 edition of Elite Cars, an article by Ted West in the February 1979 edition of Motor Trend, and an article by Jack Kroll in the February 26, 1979 edition of Newsweek, just to name a few. This section provides a glimpse at the history of Sceptre including never-seen-before artist renderings and prototype assembly photos. The first Sceptre concept drawing was done by Alfred DiMora. The inset photo shows him holding a watercolor rendering of the proposed design in December 1977. The second original concept drawing by Alfred DiMora shows the rear three-quarter view. Alfred DiMora finalizes the concept for the Sceptre 6.6S before the first build begins, January 1978. Work on the Sceptre begins in Alfred DiMora´s garage in Santa Barbara, California in 1978. Production soon moves to the Goleta airport facility. The Sceptre features a safety bladder in the fuel tank, located beneath the spare tire. This was a safety feature well ahead of its time. One of the many unique features of the Sceptre is locating the gas tank filler tube through the center of the spare tire. The Sceptre´s dash is solid walnut burlwood with a Nardi wooden steering wheel. This is the only solid black Sceptre 6.6S ever built. These two Sceptres are delivered to the same owner at his home in Southern California in 1979. A side view of the black beauty. CrossRoads published a review of the Sceptre 6.6S in 1981. A rear view of the Sceptre reviewed in CrossRoads in 1981. A rear view of the Sceptre 6.6S shown at the Santa Barbara Concours d´Elegance in 1979. A front view of the Sceptre 6.6S shown at the Santa Barbara Concours d´Elegance in 1979. The Sceptre 6.6S was shown at the 1979 Santa Barbara Concours d´Elegance just after winning Best in Class. Here is Sceptre 6.6S Number 3 with red interior and red side treatment, shown with the owner. The Winter 1978 GQ magazine highlights the award-winning Sceptre 6.6S. Cover of the first Sceptre brochure in 1978. Inside picture of the first Sceptre 6.6S brochure in 1978. Cover of the Sceptre 6.6S brochure in 1979. Alfred DiMora leads the production crew in the build of the prototype Sceptre. The prototype Sceptre tub is built entirely of steel and completely handcrafted. The Sceptre front nose starts to gain form. The Sceptre neo-classic front end takes shape. Dashboard and console are mocked up from pressboard and cardboard. This Polaroid snapshot of the headlight formation is one of dozens Alfred DiMora took bi-weekly to prospective dealers. The Sceptre gets taped for the creation and fitting of the steel front grille. The Sceptre dashboard styling begins to come to life. The crew reviews their progress at the end of the day. The prototype is prepared for rear fenders to be fitted. Quarter panels and running board take shape. Alfred DiMora with his half-completed Sceptre 6.6S prototype in February 1978. A craftsman creates the decorative side pipes and fits them to the side panels. Welding work on the tube-steel bumpers continues into the evening. Here is the Sceptre´s fuel tank with the unique plastic bladder installed for safety. The fuel filler tube protrudes through the center of the spare tire wheel, a feature never seen before or after on an any automobile other than the Sceptre 6.6S. The running boards and hood are being added to the Sceptre 6.6S. The front-end suspension includes unusually designed stabilizer bars; the lower front round steel tube is the passenger-side stabilizer. The team develops and assembles the unique rear taillights. The Sceptre is prepared for its front lights and bumper. The Sceptre uses a 400-horsepower V8 engine and a three-speed automatic transmission. A shot of the completed two-piece dashboard made of solid cherry maple. The Sceptre 6.6S is previewed at the Goleta facility before going to the Los Angeles Auto Show in April 1978. AutoWeek is sure that the Sceptre 6.6S will satisfy the exotic car buyer as the latest in automotive elegance. The foreign press shows strong interest in the Sceptre 6.6S in August 1979. A Foxy Lady postcard from Holland is yet another example of the popularity of Alfred DiMora´s designs around the world. Sceptre´s wire wheels add to its neo-classic charm. The Griffin series of kit cars were based upon the Sceptre 6.6S design, but were highly modified. Alfred DiMora develops concepts for the next generation of the Sceptre line in 1982. Click the picture to see many of these drawings. Here is an interior shot of the Sceptre just before the start of the 1978 Los Angeles Auto Show. Read the letter announcing that the Sceptre 6.6S most represented the style of the 1978 Los Angeles Auto Show. The Sceptre 6.6S won the best car award at the Los Angeles Auto Show in 1978. Alfred DiMora is sitting on the couch next to the automobile. Sceptre number 7, photographed in 2005. Sceptre in Florida in 2013. Gates Native Now Building "American Rolls Royce"